Com Dilip Saha CS and Com Soumen Ghosh ACS met GM/HR & Admin to draw his attention in matter of release of Rule 8 cases. The Corporate Office Order dated 23/02/2017 clearly enumerated the steps/criteria to be adopted for empanelment and subsequent release of the executives from among new recruits or promotees. Since a large number of JEs undergoing training for promotion to the cadre of JTO is to join soon, it is high time, administration consider the long pending Rule 8 cases under priority. Association also informed of cases held up with respective units and not forwarded to AGM/Staff-I in due time. In order to regularise the empanelment as per corporate office order, all GMs may be asked to forward the cases, if any, pending in their respective custody. GM/HR readily agreed on the proposal and said he would discuss the matter with CGM in the light of the said order. Association reminded of executives, both DEs and SDEs whose inter circle transfer order have been issued and are awaiting release from CTD. These executives have already completed more than two years in CTD and T Murugesan DE/TI/S-II is having just one and a half year of service left for retirement. GM/HR elaborated on the situation prevailing in CTD and how some targets needs to be fulfilled before 31st of March 2017. Given the situation, he assured to consider the cases by FY year end. Keynote address presented by GS, SNEA in the open session of CWC meeting held on 13-02-2017 at Indira Priyadharshini Auditorium, Hyderabad. An excellent open session was held on 13.02.2017 A/N at Indira Priyadharshini Auditorium, Hyderabad. More than 600 comrades from Hyderabad and nearby SSAs participated in the open session. It was a moment of celebration for SNEA after the victory in the membership verification among the Executives Assns. Our CMD and senior management also joined with us in the celebration. Com AA Khan, CHQ president presided over the meeting. Com K Sebastin, GS presented the keynote address. Sri Anupam Shrivastava, CMD/BSNL was the Chief Guest. 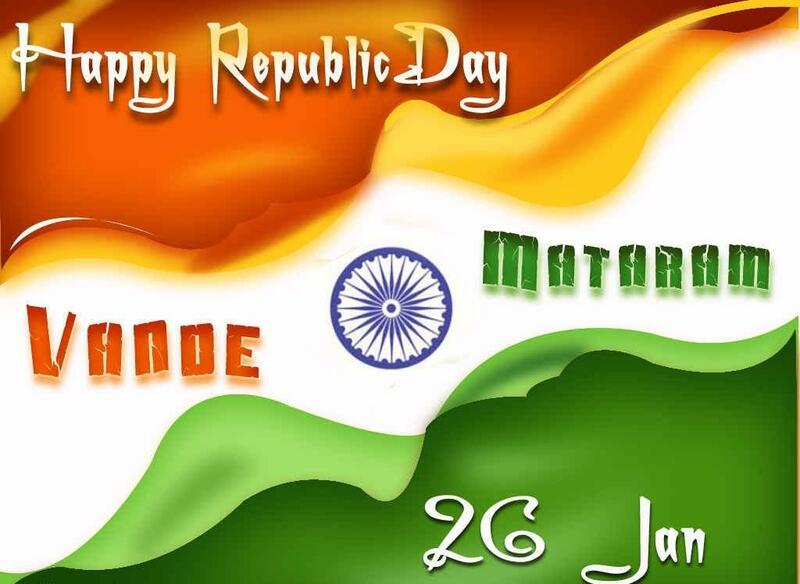 Sri R. K. Mishra, Director/ Institute of Public Enterprises, Com G L Jogi/ Chairman, Com V K Tomar, All India President/NCOA, Sri L Ananthram/CGMT, Telangana Circle, veteran leader Com S L Reddy, Sri A M Gupta, GM(SR)/BSNLCO, Sri K. Ramchand, PGM/HTD, Sri CSN Murthy/PGM, Sri Durga Prasad/PGM and other senior officers attended the open session. GS presented the keynote address giving a critical analysis of some of the issues which requires urgent attention of the BSNL management like a) Proposal for Closure and Transfer of Assets of BSNL to States, b) Tower subsidiary formation, c) Mutation of land and monetization of the land asset, d) Infra sharing, e) move for centralized payments to vendors, f) Transmission media related issues, g) BB and FTTH through Franchisees/ cable TV operators, h) Deployment of Accounts personal in CSCs, i) Deployment of more Executives from offices and indoor duties to revenue earning field units. Critical HR issues are a) implementation of Standard pay scales of E2 and E3 replacing E1A and E2A, b) implementation of CPSU Cadre Hierarchy, c) 3rd PRC implementation, d) Superannuation benefit to BSNL directly recruited employees, e) finalization of Man power plan and f) other issues like first TBP, pay parity of Rs 22820 for post 2007 rect JTO/JAOs, E1A and E2 scales for Civil/Elect/Arch/PA/PS/TF w.e.f 01.01.2000 etc. Sri Anupam Shrivastava, CMD/BSNL given an excellent address motivating the entire employees. CMD congratulated SNEA for the victory in the membership verification which has given more responsibility to SNEA. CMD told that management knew SNEA will become the number one Association in the MV. While congratulating the Unions and Association for the SWAS initiative, CMD told that it has given a new direction to BSNL and accelerated the growth. The recent initiative of the BSNL Unions and Associations for One Hour Extra Work during the last quarter of the most crucial financial year is also appreciated by CMD. Management discusses all the issues and new initiatives with the Unions and Associations before its implementation. CMD informed that 3rd PRC implementation is his top most agenda. On standard pay scales, CMD categorically assured that E2, E3 scales will be implemented and he is in touch with Secretary, DoT in this regard. CPSU cadre Hierarchy implementation will be expedited. Other HR issues also will be settled at the earliest. Sri R K Mishra, Director/IPE and management expert given the address highlighting the challenges and the priority areas BSNL should focus. He was involved in several Union Govt projects and a Govt nominee on several committees. He was a member of the search committee for the CEOs of CPSUs. BSNL has to tie up with global telecom companies to meet the challenges from other operators. BSNL has to go for big initiatives and restructure the business to meet the challenges. Com G L Jogi, Chairman SNEA highlighted the HR issues and warned management that the Executives cannot be motivated unless and until it addresses the legitimate HR issues without any further delay. Com V K Tomar, All India President/NCOA, Sri L Ananthram/CGMT, Telangana Circle and Sri A M Gupta, GM(SR)/BSNLCO addressed the open session. The open session concluded with vote of thanks by Com M S Adasul, Dy GS. Congratulations: The court case filed by SNEA at Hon PCAT, New Delhi for the pay fixation under FR22(1)(a)(1) without the restriction of FR 35 for the officiating JTOs come up for hearing today and we got favourable judgment. The benefit extended to SNEA members as in the case of others. We met PGM(Estt) and held further discussions on its immediate implementation. Once judgment copy is received, it will be immediately endorsed to the Circles, PGM(Estt) assured. Our Jt Sec Com Arvind Dahiya was present in the court to pursue the case. 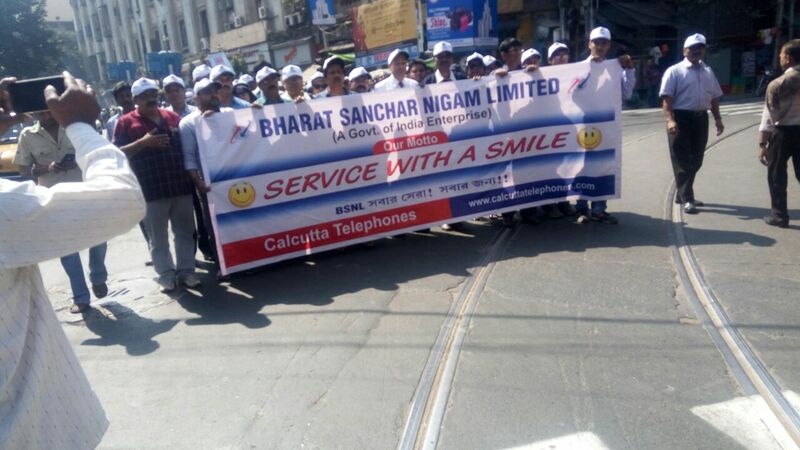 To give a fresh impetus to SWAS and to enlarge the brand presence of BSNL and its product in a unique way, Forum/CTD with unqualified support from Sales/Marketing Wing of Calcutta Telephones held a Rally from Telephone Bhavan via New CIT Road, Central Avenue, Ganesh Avenue to R N Mukherjee Road crossing. 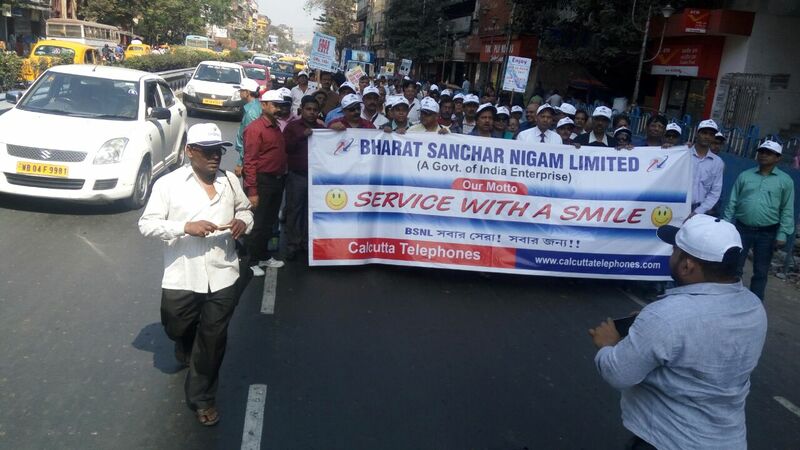 Shri S P Tripathy, CGM/CTD was the chief participant to grace the rally. 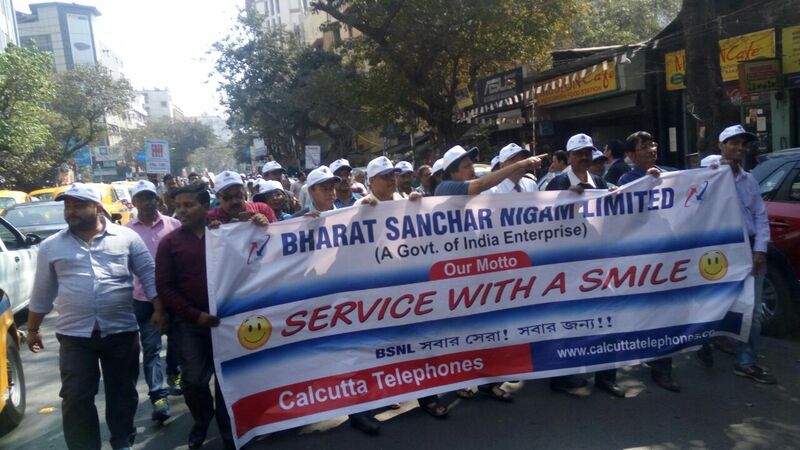 Hundreds of executives and non executives formed long queue and wound past the busiest thoroughfare of Central Kolkata, drawing attentions of onlookers and bystanders to BSNL’s product and stood amazed at the unique endeavour. 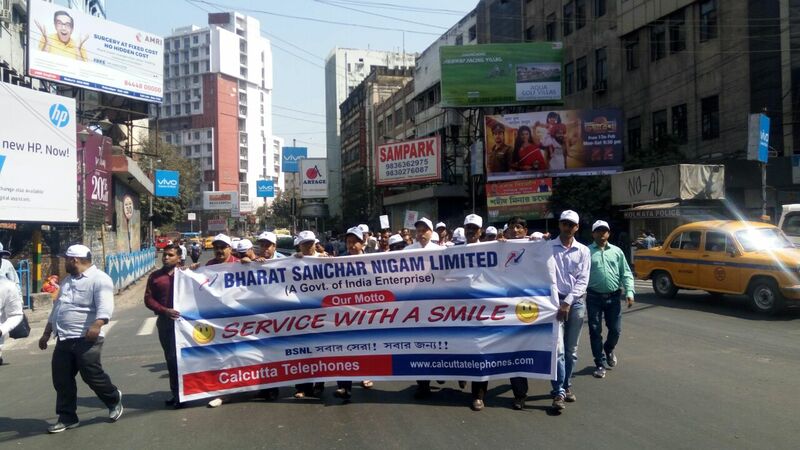 At the end of the rally, CGM thanked all and appealed to continue with the same pursuit across Calcutta Telephones. 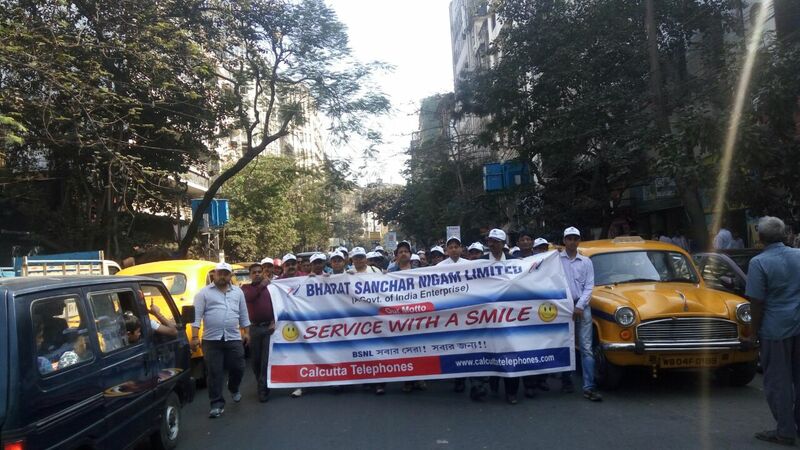 Circle Secretary, Asst Circle Secretary, Zonal Secretary/Central City zone, Organising Secretary/Central City zone and others participated in the rally. Scarcity of executives and overloading of some in view of additional charges- the defiance by some to accept responsibilty and administration remaining silent in addressing the issue. 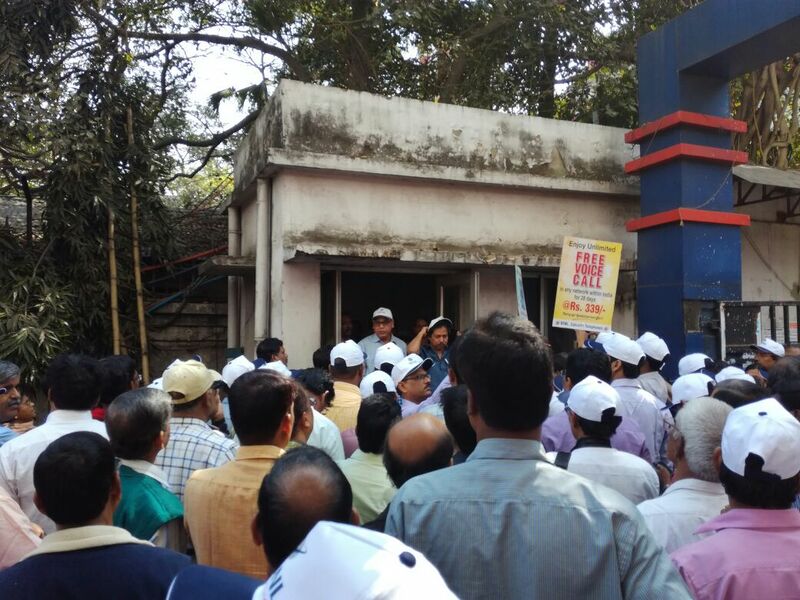 GM assured to see to the issue for uniform distribution of work. Association strongly protested against GM’s over pressurisation on field level executives for rendering day to day work. Association is not against to make executives work but then GM also should be involved and address to the genuine constraints being faced by the executives. It must be a holistic effort from all levels. Association also pointed to some actions are being kept pending giving rise to impression of bias towards some executives. GM categorically ruled out such possibility and assured to to take stock of the situation in consultation with the DGMs including implementation of long pending orders. Association submitted the chart of retirements so as to take measures in advance. Integration of some RLUs catering less than 100 customers– GM accepted the proposal and assured to review it. The constraints of limited assets in various divisions/subdivisions for payment to contractual labours–GM agreed to take up the issue with GM/Finance and CGM too. Association too would take up the same with the appropriate authority.